This lesson guide looks at the Second World War and the Home Front. It has been written with secondary pupils in mind but it may also be of use for primary pupils studying the Second World War. Note for teachers: Please use your discretion when introducing pupils to archive footage that relates to conflict and war. Britain’s involvement in the Second World War lasted from 1939-1945. During those six years of conflict, Britain’s citizens were to experience the dangers of war like never before. Aerial bombardment killed 139, 312 people in Britain between September 1939 and September 1944, with many more being injured and displaced from their homes. 1.5 million children were evacuated from the cities for their protection. The fear of gas attacks, and the reality of food shortages brought on by naval blockades also had to be dealt with by those left at home. The Government felt they should organise citizens to help defend Britain’s towns and cities. Government communications (or ‘propaganda’) of the time puts forward the idea that everyone in Britain has a role to play in fighting the war. Citizens were collectively known as the ‘Home Front’ because they were seen to be fighting the war with their actions at home, just as the young men in the armed forces fought the enemy abroad. 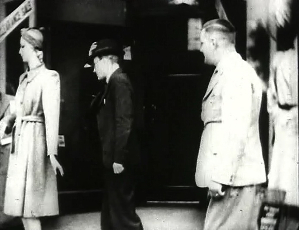 The film ‘Tenement Warden' shows the military style approach taken to organising civil defence against gas and air raids. 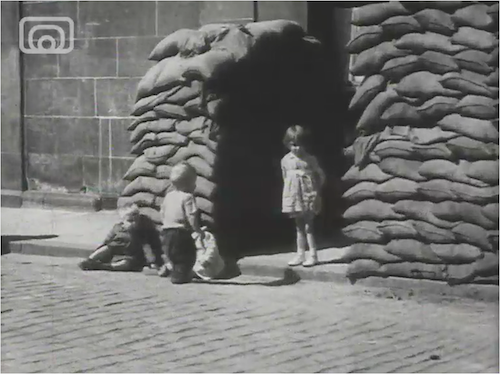 The film 'ARP Schools' was made to show school children how they should respond to an air raid attack. Why were air raids a particular risk to life in tenement areas? Who is building the air raid shelters and why? Why do they think it is necessary to train up ‘dependable people’ in each stair as tenement wardens’? Do you think this could be done now? What qualities do you think a volunteer tenement warden would need? 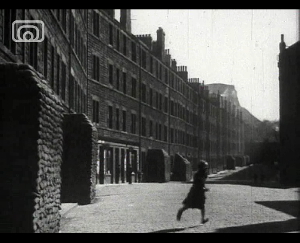 The clip mentions tenement wardens as ‘one more link in the protective chain of civil defence’. Why do you think they see it as a ‘chain’? Why might this have been important? What kinds of training and information did the tenement wardens get? Why was it important for children to watch films like these? 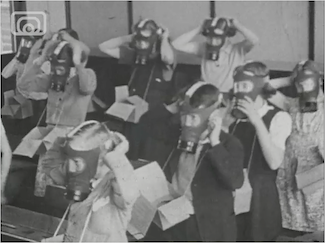 What is the signal for an Air Raid and how are the children advised to respond? What is the signal for a gas attack? Who gives the signal? What is the signal for 'all clear'? 1. Role Play – ARP Planning Committee. In small groups of 3 to 4, look at a map of a few streets in your local area. Imagine you are the ARP Planning Committee for that area. You have the responsibility of drawing up a detailed plan for air raid precautions. Your plan may include locations for shelters, appointment and training of air wardens and tenement wardens, placing of sandbags, evacuation of children, delivery of gas masks, and training for how to use them. Are there any other precautions you feel are necessary? When your plans are ready, present them to the class or write them up. Use the internet and library resources to research the work of the ARP. Create your own presentation using a digital presentation tool such as PowerPoint. Your presentation should include at least 6 slides on the different duties conducted by the ARP. Illustrate your presentation with relevant images and/or film clips. Create a poster asking for volunteers to become Air Raid Wardens. It should make clear why they are needed, what they will be expected to do and what qualities they will need to have. All able British men aged 18-41 were called up to fight, unless they were involved in some kind of vital war work. Most war work on the Home Front, however, was carried out by women, older men and foreign nationals ineligible to fight. This ranged from industrial work such as making munitions, to driving ambulances, nursing, the Land Army and a whole lot more. 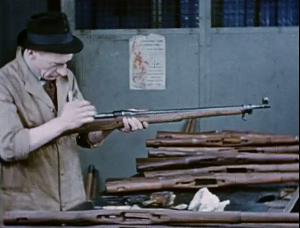 This section focuses on two clips which show the role of citizens in doing necessary war work – ‘Warwork news No 19 – The Other Man’s job’ and ‘Wood goes to War’. 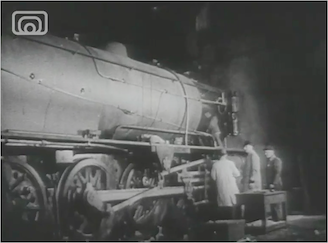 In what ways were locomotives (trains) seen as vital in the war? Why was it notable that much of the work was ‘done by girls’? Why did the Chinese man want to help make the engines? Why do you think it was important to include him in the film? What are the women in the clips making? Many women enjoyed going out to work and were reluctant to go back to being housewives after the war ended. What do you think they liked about working? Either in a small group or on your own, use the internet and library resources to research the role of women during the Second World War. Create a report or presentation covering the types of work undertaken, the benefits to the country, the skills women learned from working and society's attitudes to women working after the war. Imagine that you are one of the women munitions workers shown in ‘Wood goes to War’. Write a diary about your first week at work. Describe why you went there, what kinds of things you are doing, who you met and how you feel about your new role. 3. Debate / role play – Should women be called up to work? When Britain started calling up unmarried women aged 21-30 in 1940, it was the first modern nation to make it compulsory for women to work. Split into two sides to debate and vote on the topic ‘Should women be called up to work?’ You might wish to take on different roles - such as an MP, a woman with a family, an unmarried woman, a soldier, and an older male worker. 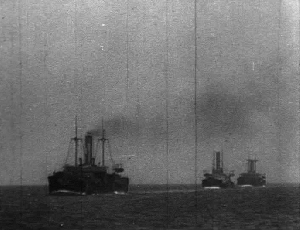 We will now look at two clips made by the Government to communicate messages to citizens – ‘Give us more Ships’ and ‘Ministry of Food flashes part 1’. Good Government communication with the British people was key to ensuring that everyone was organised to fight the war on the Home Front and that morale was kept up amongst the population. Much of this communication can be termed ‘propaganda’ - an attempt by the Government to get people to believe certain things and act in a certain way. What is the aim of this film? Do you think it is effective? What devices were used by the filmmaker to persuade people to give money for ships (think about the music, words used, tone of voice, what is shown and how it is shot)? What kinds of goods were the ships transporting? Why were these vital in the war? Why was it important that people save food? What items were being recycled or reused in the film? Why do you think they were chosen? What do you notice about the dialogue in the film? Why do you think the film maker chose to have this kind of dialogue? Why are the women in the film queuing for food? Why were ration books used? In what ways do you think they might have been important in keeping British citizens happy and healthy? Wasting food and not recycling is still seen as a problem in society now, albeit more from an environmental perspective. In small groups, develop a storyboard for your own short film encouraging people today not to waste food and to recycle. You might want to use some of the techniques shown in the Ministry of Food flashes. Your storyboards can be further developed into short films with each group member playing a role in the film crew (as writer, director, actors, etc). Research both British and German propaganda and develop a digital presentation showing the types of propaganda used, the intentions behind them and their effectiveness. 3. Propaganda leaflets – Don’t waste food! Create a leaflet on the theme ‘Don’t Waste Food – Win this War!’. Use language and graphics that are appropriate for a 1940s audience. Make sure you include explanations of what was to be done with waste food during the Second World War and why. This lesson guide was prepared by Olivia Drennan. Updated May 2016.